Research indicates meditation can have positive effects on us mentally and physically. There are many forms and approaches to meditation. 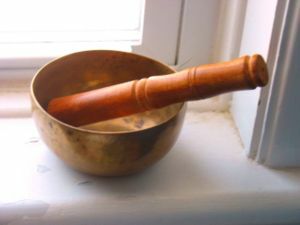 Today I led my first Singing Bowl meditation in an assisted living facility. It was present as part of this month’s Brookdale Senior Living Celebrations theme of Mount Everest, Tibet. We created a beautiful melody. Here’s how I set up our meditation. As most residents in northwestern Kansas find this place distant and unknown, we started singing a few folk and gospel songs about mountains while seated in a circle. This was followed by a scarf movement activity to “Ain’t No Mountain High Enough”. Laughter and smiles seems to be a comment response of the clients. I wanted to be sure everyone was awake, ready to do something different, and hopefully in a positive state of mind. Next we listened to a recording of John Denver singing “Rocky Mountain High” and discussed the lyrics including where mediation was mentioned. Different forms of mediation and benefits of mediating were discussed. We will begin our meditation with a few breaths. I will sound the bowl. As you feel ready, play your instrument as often as you wish, when you feel moved to do so. When I feel we have completed the process, I will sound the bowl to end our playing and meditation. All in all, they seemed to enjoy and to benefit from the process as did I. It is something I’ll share again with them. Our meditation closed and we went on to sing other mountain songs. For people on the high plains, it was a mountain top sing!